Creamy and citrus-y cheesecake bars with sugar cookie crust. Very easy to prepare and guaranteed to be a big hit in family gatherings and casual dinners with friends! 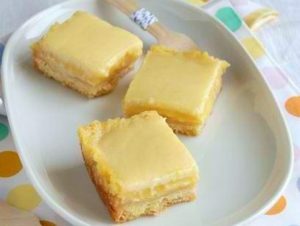 Here is an easy dessert recipe for Orange Cheesecake Bars. Preheat oven to 375 degrees Fahrenheit. Grease a 9×13 inch baking dish. In a separate bowl, cream together butter and sugar until light and fluffy, about 3 minutes. Add the egg, sour cream and vanilla and mix well. Gradualy add the flour mixture and stir until well combined. Press and spread the dough evenly into the greased baking dish. Sprinkle orange zest on top and set aside. In medium bowl, beat cream cheese, sugar, marmalade and liqueur with electric mixer on medium-high speed about 1 minute or until well blended. Add eggs; beat about 2 minutes or until well blended and mixture is creamy. Spread evenly in crust. Bake 29 to 36 minutes or until crust is golden brown and center is set. Cool 1 hour. In small microwavable bowl, microwave whipping cream on High about 30 seconds or just until boiling. Add butter and baking chips; stir until chips are melted. Spread mixture evenly over bars. Refrigerate about 1 1/2 hours or until chilled and firm. To serve, cut into 6 rows by 4 rows, using thin, sharp knife and wiping blade occasionally. Cover and refrigerate any remaining dessert squares.